Grace and truth found their perfect union in Christ, but the rest of us tend to gravitate toward one or the other. Truth without grace breeds self-righteousness and legalism. Grace without truth breeds deception and moral compromise. The key to true Christian spirituality is to integrate these two qualities into life, imitating the character of Christ. Our ability to be gracious flows from recognizing how much God has done for us and how little we deserve it. Truth acts upon us, helping us to see reality according to God’s perspective. As we learn to apply the truth in a gracious manner and to be gracious within the bounds of truth, we will indeed reflect Christ to a world clamoring for authenticity. Grace caught the first century Jews by surprise. Though there were glimmers of grace in the Old Testament, it focused on man’s responsibility to God’s truth. In Jesus, however, they saw not only truth incarnate but grace incarnate as well. Today, even with the example of Christ, Christians still tend to be surprised by one of the two. Some cling to truth but struggle with grace, while others focus on grace at the expense of truth. Christ, however, was not part truth and part grace. He was all of both. To resolve the paradox of truth and grace so common in our experience, we need not seek to balance the two qualities by pitting one against the other; we must be full of both. Sinners generally feel uncomfortable in the company of Christians, and yet they enjoyed Jesus. That’s because even though His words were sometimes challenging, He nevertheless exuded grace. Certainly, the truth will offend some people, but if we scare everyone away, something is wrong. Grace and truth are like the two strands of DNA’s double helix, creating a perfect symmetry of Christian character. Often, it is our fellow Christians who do not understand. Consider the case of the church that picketed abortion clinics only to find their church picketed in return by proabortion groups. The congregation graciously provided doughnuts and coffee for the protesters and sought to talk to them about Christ. But some street preachers showed up to antagonize the abortionists, ruined the opportunity, and ended up picketing the church themselves. It’s not fair. Jesus, the sinless one, was pursued, persecuted, and tortured—not because of anything He had done, but to save those who least deserved it. Though we are utterly undeserving rebels, God nevertheless treats us as His children. And if this seems less than amazing, less than wonderful, then we really don’t grasp the meaning of grace. We are rebels who murdered the king’s son but are still invited to eat at His table, we would be overwhelmed with gratitude rather than pestered by disappointment. God’s grace, however, is not limited to what He’s done for us in the past. Many people are still living in spiritual poverty, simply because they do not realize the riches they possess in Christ. God doesn’t expect us to live the Christian life by works. Rather, He calls us to continue to acknowledge our spiritual impotence, accept His everyday grace, and live in gratitude, knowing that because grace is forever, we will spend eternity with our Lord. Some people are worried that because they’ve failed God so often they are unworthy of His grace. But it’s that very unworthiness that makes grace so amazing. It’s what motivated John Newton, the English slave trader whom God wondrously converted, to compose that classic hymn. And because every Christian heart is touched by grace, “Amazing Grace” still moves us to eternal gratitude today. Truth is no longer fashionable. It has gone out of style. Almost 70 percent of Americans polled would not affirm that “honesty is the best policy.” Academics plagiarize. Politicians re-invent their pasts. Coaches embellish their accomplishments. Advertisements offer a lifestyle they cannot deliver. On our campuses truth has been turned inside out. Scholars wax eloquent about the nobility of pursuing a truth they don’t expect to find, a logic they certainly would not apply to finding a parking space. Some insist that there is no such thing as truth—an assertion, which must then itself be false. Others reduce truth to mere sincerity, though quite obviously earnestness will not save you if you walk off a cliff. Or maybe truth is relative—meaning that if we both walk off a cliff, only the one who believes in gravity will fall. Even in the church truth has fallen on hard times. Theological illiteracy abounds. But without that truth we have no message. Without the truth about God and His holiness, without the truth about our sinfulness and its consequences, there can be no grace either. If, on the other hand, we take the grace out of truth, Christianity turns into a powerless legalism. Though truth has fallen on hard times, it is really God’s gracious guardrail, a protection that keeps us from going over life’s edge. Only when God’s standards are presented in the context of grace, however, will we comprehend that they exist for our benefit. How can we define this biblical concept of truth? It is more than facts. Truth requires a response. Far from being subject to our subjectivity, truth acts upon us, because God writes it on our hearts. We are to love it, believe it, and walk in it as we see that truth manifested in the One who is the way, the truth, and the life. And we must be constantly aware of Satan, who hates the truth and peddles lies. Truth is not determined by what we want to believe. We all have beliefs, but those beliefs are either true or false, and we have the responsibility to be like the Bereans and subject our ideas to the truth of God’s Word. Christians cannot fall for an all-inclusive, all-affirming Oprah Winfrey-style faith. Either Jesus is is the only way or He is no way at all for those who are headed for a Christless eternity. Others may call this arrogance, but it could only be arrogance if it were our idea to begin with. If, in the name of tolerance, we fail to point out that Jesus is the only way, we not only fail the truth, but fail to communicate grace to those who are headed for a Christless eternity. Jesus’ very ministry began with a poignant juxtaposition of grace and truth. He turned the water into wine in an act of grace. But immediately afterward he took a stand for truth, driving the corrupt merchants from the courtyard of the temple. Obviously, both of these elements are important, but just what is the balance, the proper relationship, between the two? Truth without grace leads to legalism. Truth is good advice, but people need more. They need the good news of grace. Perhaps that explains the enduring popularity of Les Miserables, for it is a story of Jean Valjean, a man transformed by grace. Grace is not mere tolerance. It is not a lowering of the standard. It makes us more, not less, holy by raising the bar—and then gives us a boost. To avail ourselves of that grace, we must first renounce our self-righteousness. Those who maintain that all religions are the same have not taken grace into account. In a conference on comparative religions British scholars debated if there was one belief totally unique to the Christian faith. When C. S. Lewis happened by, they put the question to him. "That’s easy," he replied. "It’s grace." John 1 tells us that Jesus was full of grace and truth. John 2 shows us. In successive scenes Jesus changes the water to wine and then storms through the temple, overturning the tables. This, not the modern, mythological Jesus, is the authentic version. Today we too often confuse Christlikeness with niceness. Christians are now waffling on the reality of hell, trying to be nice. But true love tells the truth. Instead of asking why God sends people to hell, we ought to be asking why He would save any of us. The answer is grace. And grace is cheapened if there is nothing from which to be saved. Grace and truth can, should, and must co-exist. But even in today’s political arena we are often forced to choose between the two. Liberals want grace at the expense of truth. Conservatives insist on truth but often come across as heartless. But why can’t we oppose injustice to minorities and to the unborn, or fight both New Age environmentalism and industrial irresponsibility, or condemn immorality—while reaching out to AIDS victims? Grace is a scandalous concept. It seems too easy, too cheap. The problem is that our pride drives us to insist on doing something to merit that which we don’t deserve. All God really asks of us is gratitude and a heart willing to show grace to others as freely as we have received it. Do We Have a Double Standard Regarding Grace? 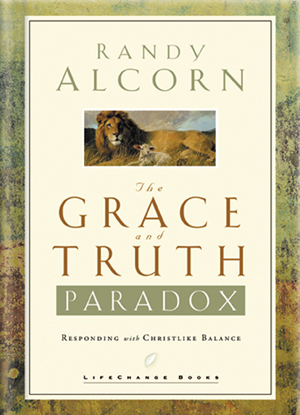 Randy Alcorn answers the question, "How do we overcome giving so much grace to ourselves but not to others?"